Like most universities, the University of Toronto provides general but useful tips on academic writing. Their dedicated site on academic writing may also be of help when you find planning and organizing your writing work hard. Please be mindful of the subtle differences in how to format your references. Toronto's style guide slightly deviates from the MLA Referencing Guide we use at the UVA, which you can download here: MLA Referencing Guide. Getting started can be notoriously difficult. While it persuasive to postpone your writing work, you will have to do it sometime. To learn how to cope with procrastination, consult this page on UNC’s Writing Center. Writing a thesis, or dissertation can be overwhelming. For starters, make sure you pick a topic you're passionate about. When you have decided on a topic, this document might be of help for the actual writing and research work. If you experience writing anxiety or a writer's block, it might be helpful to read about these tips to get more confident (and excited) about your writing. Australia's Monash University has a nice site on how to write a thesis, and more specifically, how to plan your writing work. If you rather want to watch a helpful video, this 20-minute lecture from Massay University will tell you about the key points you should consider when writing your thesis. The UVA also offers several documents on writing your thesis. You can find the guidelines for the MA New Media thesis here. Before you start writing, it is helpful to first structure your sources and other related material. This guide offers tips on how to research, plan and write such an essay. You may want to try working with a reference manager such as Mendeley when you’re writing your thesis. If you want to organize your sources, an application like Scrivener might be useful. You can try Scrivener for free. If you find their software helpful, you can pay to get the full version (Mac and PC). Ulysses is an alternative to Scrivener. You can download Ulysses’ mobile app for  9.99 in the App Store. UNC's Writing Center can be a valuable resource when writing your thesis. Amongst other things, you can find information on how to refine your central argument by asking the right questions. A well-thought-of structure will make your thesis (and other writings) easier to read and bring about a stronger argument and conclusion. Amongst other points, pay attention to your argument, how your paragraphs are structured and the transitions you use between different sections. Never forget for whom you are writing your thesis. Learn about how to write for the appropriate audience. To get your point across, it is important to know how to refine your argument. If you're unsure about your writing style, UNC's Writing Center has plenty of helpful articles online that will assist you in exactly this. The right choice of words, for example, can help you to better express your thoughts, and consequently strengthens your point. A non-academic but potentially helpful site is Business English Pod. If you're doing research, you might at times need some sales skills, for example when you're trying to convince someone to participate in an interview or survey. In different cases, you might have to get a company to provide you data. This site is full of tricks that will tell you how. Brian Clark's blog is a valuable resource for tips on how to make your writing more persuasive. At the same time, Copyblogger points to widespread mistakes in both spelling and grammar, some of which you might occasionally make yourself. Note that Copyblogger focusses on commercial rather than academic texts. Papers should be written more formally and reserved than is generally advised here. Google Books can be of help if you want to improve your academic English. Search for academic writing, for example, and find plenty of books that might help you with particular grammar issues or questions relating to the structure of your argument. If you want to improve your English on a daily basis, you can sign up for a daily multiple-choice test via Nu Beter Engels (Dutch, but intuitive). The questions are generally not too hard but they will help to keep you focussed and occasionally expand your vocabulary. The Oatmeal has some entertaining cartoons online on proper English. You can consult these as an initial source for learning about the correct use of apostrophes, semicolons, literally and irony. Also note his cartoon on common misspellings. 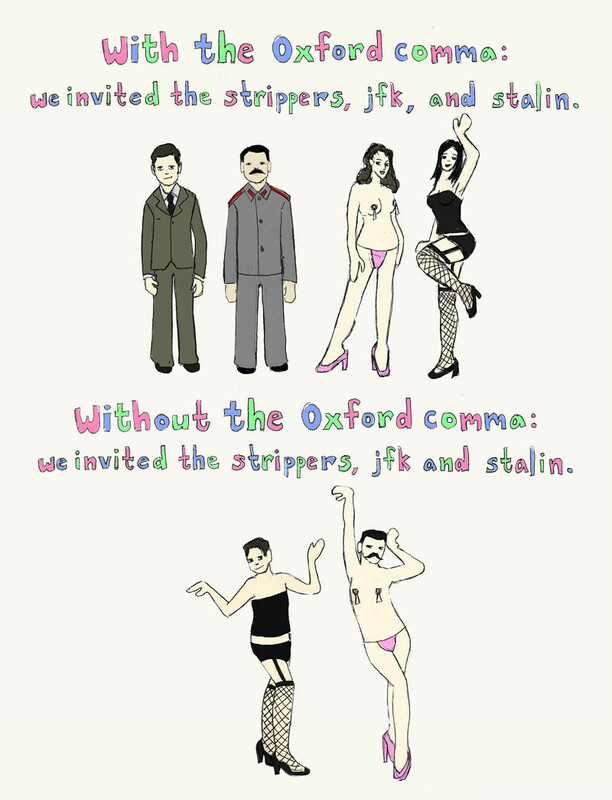 Another site that hosts some nice infographics on grammar is Grammar.net. These are particularly helpful to keep you sharp on spelling. Another good source for checking your grammar and punctuation is GrammarBook.com or read about the most common mistakes in this file from the University of Essex, illustrated with examples. When it comes to specific issues, such as 'like versus as', Quick and Dirty Tips' Grammar Girl is one of the best places for finding answers. All articles are very well written, example-rich and available as a streamable podcast. When writing an academic paper, you might need to check some words for their meaning or spelling. The Cambridge English dictionary gives definitions and examples for practically every word term. Another widely consulted work is the Oxford English Dictionary (OED). The OED also provides tips on topics like grammar, spelling and punctuation. The OED is well structured and provides solid information. Reference.com's dictionary also gives you English explanations, the term’s origin, its history, synonyms, relevant questions and examples. If your university is subscribed to a particular dictionary, you can consult the full dictionary online without cost via the university network or VPN. UVA's Mediatudies Department uses MLA-guidelines to cite sources in academic texts. You can download a version of this guideline here. Other faculties or Universities might use different guidelines on how to cite. To get more information about citation according to APA-guidelines, you can check apastyle where you can learn the basics through free tutorials. For general guidelines on APA visit Purdue OWL or MUN library. Plagiarism is said to be the biggest crime you can commit with a pen. Make sure you always refer back to the original author. If you want to be sure you're on the safe side, there are tools that will check your paper for plagiarism. Since it is highly promoted on Google and other academic websites, Grammarly is one of the better-known tools for checking your academic work. Grammarly proofreads (grammar, style, sentence structure, etc.) and checks for plagiarism. You can test Grammarly for free for seven days. A subscription to their service is quite expensive, but worth it if you want to ensure the academic validity of your work. Grammarly's Facebook page is worth a visit. CheckForPlagiarism.net is cheaper alternative to Grammarly. It costs about $40 for 15 submissions and refers to a wide range of academic books, papers and journals. Checklists can be quite helpful; as a final check, but also to examine your first draft. Even questions like 'Is your thesis clearly stated near the beginning of the paper?' will help you to make a stronger overall case. There are many guidelines and checklists online, but you might find this one from Leeward College helpful.